Lagos State Governor, Mr. Akinwunmi Ambode has hinged the effective policy implementation of his administration on the positive attitude of civil servants to work and their commitment to government’s vision for good governance. Ambode disclosed this today in a keynote address delivered at the grand finale of the Year 2018 Public Service Week held at the Adeyemi Bero Auditorium in Alausa Ikeja Lagos. The Governor, who was represented by his deputy, Dr. Oluranti Adebule, noted that the State government had realised from inception that transforming governance in a State with the population of about 24 million people would require an injection of creative ideas. He added that his government has enjoyed tremendous support and cooperation of the public servants whom he said showed a genuine commitment to various reforms introduced by the administration towards repositioning the public service to meet the needs of the society. Ambode, while describing the theme of the celebration, “Transforming Governance To Realise The Sustainable Development Goals”, as very instructive and relevant, noted that the 21st Century public service, driven by knowledge and technology, cannot be ignored in a bid to transform the society into a Smart City and build an economy that is globally competitive and sustainable. The Governor further disclosed that one of the strategies initiated by his administration to facilitate the necessary transformation process in the civil service was the growth mindset programme, which he noted was basically geared towards bringing about a change of orientation, positive attitude to work and good behaviour of public servants so as to achieve efficient service delivery. 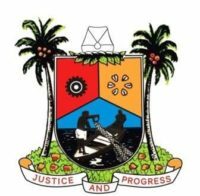 He commended the drivers of the initiatives and the entire civil servants for keying into his administration’s vision of a proactive public service that would drive government policies for a greater Lagos with sustainable developments. In his words, “I enjoin you all to fully embrace this initiative because it is the only way to go in order for the Lagos State Public Service to continue to occupy its leadership position and also remain relevant in a fast-changing world”. 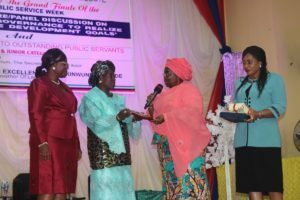 While presenting the Merit Awards to 90 public servants that distinguished themselves through hard work and productivity, Ambode reassured them that his government would continue to play its role as a government that prioritises welfare and provides everything that is required to enhance performance in the discharge of employees’ responsibilities. Earlier in her welcome address, the Head of Service, Mrs. Folashade Adesoye stated that public service celebration and the recognition of outstanding public servants is aimed at highlighting the contributions of the civil servants to good governance and efficient service delivery. Adesoye noted that various innovations introduced to the celebrations are to further encourage employees to work harder and increase their productivity so as to motivate other public servants to aspire for better performance in the overall interest of the public. The Guest Lecturer and Dean, Faculty of Arts, Lagos State University, Professor Adeleke Fakoya who spoke on the topic: Transforming Governance to Realise Sustainable Development Goals, commended Lagos State government for providing leadership in good governance through the implementation of policies that are rapidly transforming the State in the last three years in line with the United Nations’ Sustainable Development Goals (SDG). He urged the State government to immediately embark on some reforms such as digitalisation of its data system, development and funding of Technical and Vocational Colleges for skills and vocational acquisitions, sincerity of purpose in the implementation of its Public-Private Partnership and the development of agriculture for food productions so as to achieve zero tolerance for hunger among others.